Shop Chocolate online at Chocolate.com for handmade, artisan, and gourmet chocolate gifts from world-class chocolate vendors. Chocolate.com is brilliant at bringing together the chocolate chef and the gift buyer to form a unique and delicious product. Chocolate.com also offers its own brand of fully customizable chocolate, create personalized chocolate pops, trading cards, business cards and medallions. You are sure to satisfy the chocolate lover in your life with the variety of stellar chocolate goodies available at Chocolate.com. Save on your next purchase from Chocolate.com with discounts, coupons and savings from 58coupons.com. Enjoy free shipping on select items from Chocolate.com. Click link to see the selection. Use this code and save 15% on any order from Chocolate.com. Save 5% on all orders from Chocolate.com when you use this coupon code at checkout. 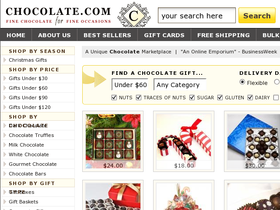 Sign up with Chocolate.com and receive a $5 credit towards your next purchase. Click link for details. Visit Chocolate.com and buy from a great selection of delicious gifts starting under $25. Click link to see the selection.